Body (To The Ground) and Things I Do For You. Solo, Michael also sang another song from the DESTINY album, Push Me Away. The Jacksons perform a concert in Brighton, UK on Destiny tour. 1988 - Michael Jackson is finally arrived in this Panhandle city to rehearse for his concert tour “BAD”. After bad weather in Atlanta delayed his arrival by three days, a publicity spokeswoman said. On Monday afternoon, Jackson arrived in the same Eastern Airlines that carried the Pensacola Tornados of the Continental Basketball Association home from a road trip. The singer is sharing the 10,000-seat Pensacola Civic Center with the Tornados, who had a home game scheduled Tuesday night, as he rehearses through February 18 for a 13-city tour that begin Feb. 23 in Kansas City, Mo. Jackson was expected to arrive Friday night. The performer was met at the airplane's steps and whisked away. Television cameras caught only a fleeting glimpse of him. Jackson's lighting equipment and stage and a 100-person entourage of musicians, backup singers and others began arriving two weeks ago, but Jackson does not plan any public performances in Pensacola. 1992 - MTV kicked off its first global sweepstakes with "My Dinner with Michael". Winners from around the world attended a dinner party hosted by Michael Jackson on the set of his music video "In the Closet". Michael Jackson departs for a one week tour to Africa at LA airport. He travels for 11 days to visit hospitals, orphanages, schools, churches & institutions for mentally handicapped children, covering about 30,000 miles on his journey. 1993 - Michael Jackson is interviewed by Oprah Winfrey at his Neverland Ranch. It is his first live TV interview in 14 years. During the 90-minute special, he opens up about his personal life and career, clears up some misconceptions and rumors about himself and gives Oprah a night time tour of his ranch. In the interview, Jackson claims that he has a disorder that destroys the pigmentation of the skin. He also claims he's had very little plastic surgery. Elizabeth Taylor made a surprise appearance during Oprah Winfrey’s primetime interview with Michael Jackson. Elizabeth, who at first didn’t intend to appear on the program, set the record straight about her friendship with her friend Jackson and the controversy surrounding him. He also dances live in his theater and gives the audience a special an a-capella performance of “Who Is It”. The live telecast attracted about 85 million viewers in US alone, and was the 4th most watched TV event in history. It was the most successful ABC entertainment special ever. Note: In spite of Jackson’s good-will and generosity, Winfrey, as, in fact, various other journalists, will prove/have proven to be biased, her not believing in Jackson’s innocence of wrongdoings towards children and expressing this on several occasions, particularly during the 2005 trial completed with the entertainer’s vindication. 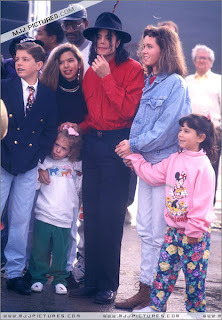 The World première of Give into Me video took place on February 10, 1993 during the worldwide live telecast from Neverland Valley of "Michael Jackson Talks... To Oprah". The video clip is starring Michael Jackson and Slash. Shooting of the video clip took place in Munich, Germany. Video clip produced by Phil Rose and Warren Hewlett. Staging Michael Jackson. Directed by Andy Moharan. 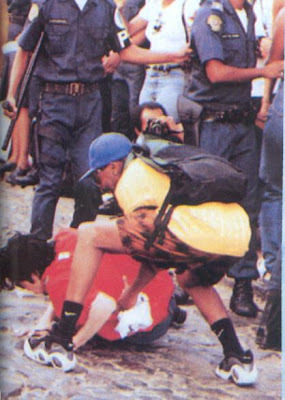 1996 - Michael Jackson flew into Brazil to begin filming the second video for "They Don't Care About Us". He was welcomed with near-hysterical enthusiasm by fans in Salvador. 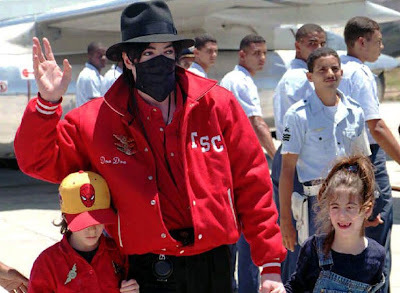 Hand-in-hand with two Casio children -- and with only his eyes visible above a black surgical mask -- the singer sprinted across a shimmering runway to wave to hundreds of fans gathered on an airport balcony. "He started running toward us and I almost fainted," said breathless schoolgirl Sheila de Oliveira, still in tears after her not-so-close encounter with the star. For the first time in his career, Michael made a second music video for a single. Plans by Michael and director Spike Lee to film in Brazil have caused an uproar. State authorities unsuccessfully tried to ban the singer filming in Rio de Janeiro and Salvador (Pelorinho). Officials feared images of poverty might affect tourism and accused Jackson of exploiting the poor. Ronaldo Cezar Coelho, the state secretary for Industry, Commerce and Tourism demanded editing rights over the finished product. Some were concerned that scenes of poverty and human rights abuses would affect their chances of hosting the Olympics in 2004. Others supported Jackson's wish to highlight the problems of the region, arguing that the government were embarrassed by their own failings. A judge banned all filming but this ruling was overturned by an injunction. Although officials were angry, the residents were not and Jackson was surrounded by crowds of enthusiastic onlookers during filming. One woman managed to push through security to hug the singer who continued dancing while hugging her. Another woman appeared and hugged him from behind. He then fell to the ground as police pulled the two women off him and escorted them away. After the director helped Jackson get up off the street, he continued to sing and dance. This incident made it into the music video. 1,500 policemen and 50 residents acting as security guards effectively sealed off the Dona Marta shanty town. It was alleged that Jackson's production team had negotiated with drug dealers in order to gain permission to film in one of the city's shantytowns. "'They Don't Care About Us' has an edge, and Spike Lee had approached me. It's a public awareness song and that's what he is all about. It's a protest kind of song ... and I think he was perfect for it". Jackson also collaborated with 200 members of the cultural group Olodum, "who swayed to the heavy beat of Salvador's 'samba-reggae' music". Producing the first video proved to be a difficult task for Jackson. The music was changed slightly to fit Olodum's style of drumming. 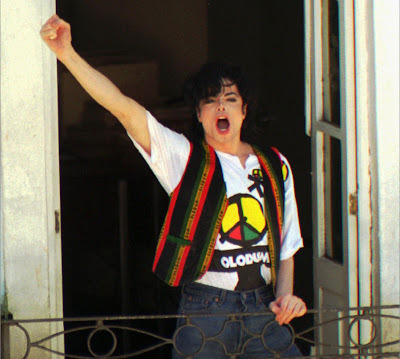 The "Olodum version" (unofficial title) of the song has since become more popular than the original album version. The media interest surrounding the music video exposed Olodum to 140 countries around the world. It brought them worldwide fame and increased their credibility in Brazil. At the beginning of the video, a Brazilian woman says "Michael, eles não ligam pra gente" which means "Michael, they don't care about us". In 2009, Billboard described the area as "now a model for social development" and stated that Jackson's influence was partially responsible for this improvement. 2000 - Michael has selected "The Firm" as his new management company. "The Firm", a two-year-old company described as "one of the hottest music management teams in the world", is headed by Jeff Kwantinetz and Michael Green. John McLain, a family associate and former high-ranking A&M executive, will remain involved in managing Michael Jackson. This entry was posted on 10 February 2011 at Thursday, February 10, 2011 and is filed under 1979, 1988, 1992, 1993, 1996, 2000 . You can follow any responses to this entry through the comments feed .